SuperBowl Sunday is reputedly one of the biggest television viewing days of the year in the United States. I’m guessing that might depend on which teams are playing and how big the rivalry is (Wikipedia gives interesting biggest-TV-audience stats here). And for sure, this is also a day people tend to say the hell with the diet. So whether you’re making stuff at home, or heading out to let someone else do the cooking and cleanup, here are a few last-minute ideas for your enjoyment and edification. Like to keep the dirty dishes to a minimum on SuperBowl Sunday? Try Nuvino wine in portable PreservPak pouches. Comes in Chardonnay, Malbec, Red Blend, and Sauvignon Blanc. If you don’t drink ’em all up at the party, they’ll keep fresh up to 18 months. Just think of all the glasses you won’t have to wash.
Commonwealth Tavern, 2000 W. Roscoe St., has brunch from 10 a.m. to 2 p.m. with $6 bloody marys and $12 mimosas. $5 stadium cups, $15 Miller and Coors buckets, $4 Tecate cans, $5 Lagunitas drafts, and $10 themed food specials created by Chef Donny Farrell. Hold your spot ahead 773.697.7956. Compass Bar, 433 W. Diversey offers a $10 Super Bowl Chili Frito Pizza along with 200 different beers plus line cards and prize giveaways each quarter. Lottie’s, 1925 W. Cortland, has a Half-Time Competition. Kick a field goal to win a $250 prize. Meanwhile enjoy the game on multiple screens, drink up $4 Jameson, $15 Miller and Coors buckets, and dig in to a $15 party platter (14-inch cheese pizza and bucket of wings and tots). MAK,1924 W. Division has BOGO wangs on Super Bowl Sunday, Feb. 1. Crispy fried with a sweet and spicy sauce, get in all sizes, to go, dine-in & delivery. ROCKS Northcenter, 4138 N. Lincoln, and ROCKS Lakeview, 3463 N. Broadway, $20 Bud Light Towers + 50¢ Wings. Plus discounts, raffles and giveaways. The Pony, 1638 W. Belmont, has a free Jameson’s half-time competition – kick a field goal to win a $250 prize. Deals on Jameson, beer buckets and a $15 Punxsutawney party platter (16-inch Clydesdale grilled cheese plus wings and tots). Tavern on Little Fort, 4128 N. Lincoln, has a Chili Cook-off starting at 3 pm, with judging at half-time. Prizes are as follows: $200 cash (1st place), grill set (2nd place) and Coleman picnic chairs (3rd place). Bring your own crock-pot with your best chili. Ten bucks buys any patron a “judgeship” and the right to enjoy chili samples, wings, sausage, dips, chips, and veggies. $3 domestic specials, $5 microbrew drafts, $4 well drinks and $4 Fireball shots. With a nod to Billy Joel, I tell you I’m in a soup-making state of mind. Moroccan soup (Photo credit: Wikipedia) This looks kinda like my lentil soup. Sunday, a pot of lentil soup without the Italian sausage I usually like to add. But a single package of More than Gourmet demi-glace gave it a touch of nice beef flavor. Then the addition of my newest hot sauce discovery just about made up for the missing spice of the sausage. Happily, there’s now a serving sitting in the freezer to be savored again soon. Today the last dib of lentil soup made a nice breakfast treat. But later, as the morning wore on and hunger crept in again, I was devastated to think I didn’t have any homemade soup to turn to. Mexican meatball soup. (Photo credit: Wikipedia) The Zesty soup I made has corn and black beans. That is, I do, but I can’t eat any more of the soup I made on Saturday. The full-sodium chicken broth I used for it made the flavor of this chili-scented Mexican soup (from World’s Healthiest Foods) even more fabulous, but the salt content made me blow up next day like one of those giant over-filled tires they use in the monster truck crash derbies. I will definitely make this soup again, but not until I unfreeze my own chicken stock or buy some with less sodium. So while I pondered which of my neighbors might be able to enjoy the remaining Zesty Mexican Soup without being in danger of exploding from sodium, it occurred to me there was still a leek and half a cabbage sitting in the fridge. These, along with carrots, onions, etc., were just what I needed to make one of my favorite vegetable soups from the book, “French Women Don’t Get Fat.” Author Mireille Giuliano, the CEO of famed champagne maker Veuve-Clicquot, offers sage advice and many slimming soup and other recipes. More about this and more recipes to come in the cookbook I’m working on—working title, 17 Ways to Eat Your Way to Happiness. I don’t know how long I’m going to be in this soup state of mind, but it’s fun while it lasts. P.S. Recently I had some of the most flavorful lentil soup I’ve ever tasted at Nookie’s Tree, 3334 N. Halsted. Alas, they wouldn’t divulge the secret. I became a fan of hot sauce late in life and am still a complete lightweight. But I got introduced a few years ago when I read a fascinating book called The Raw and the Cooked, by and about gourmand author Jim Harrison, who carried his own bottles of hot sauce with him everywhere he went. I loved the book so much—and was so impressed with his passion for food and his ability to express it—I thought I’d try imitating the guy’s habit. Tried using some of his favorite, the original Cholula brand, at a Mexican restaurant and wasn’t thrilled. I figured maybe I’d like a different flavor, so I bought a bottle of Cholula chipotle-flavored hot sauce. It’s still sitting half-used on my shelf after several years. Just didn’t like the flavor or the way it so markedly changed the taste of my dish. Then I learned from a Bon Appetit recipe for Bloody Marys about another type of hot sauce known as sriracha. Found it at the store, liked what I tasted. Looked for more ideas for using it—found dozens posted online by heavy duty fans of the stuff. And then I tried a recipe that has made this bright red sauce that comes in a Christmas-green-nozzle-top bottle a staple in my kitchen. Here’s the recipe: Buy some sriracha. Put some sour cream in a dish. Start stirring in sriracha until the cream turns a lovely light orange-ish color—the darker the color, the spicier the dip. Now dip something in it—sliced cucumbers, steamed green beans or cauliflower, celery sticks, Doritos, potato chips, almost anything your heart desires. If you like spicy, there’s no way you won’t agree this is a heavenly way to dip. I’ve since switched to using 2% Greek yogurt for the sour cream and now feel quite virtuous that I’m taking in protein, calcium and “live yogurt cultures” at the same time I’m chowing down joyfully for my tastebuds. Mix with salsa for a nice switch. Use it on sandwiches or dip plain chicken in it. In case you prefer more sophisticated uses, here are some other popular ways to use sriracha. Now, the news is I’ve found another one I like a lot. It’s called Tabanero hot sauce (the name is a combination of habanero, as in peppers, and Tabasco, the little spot in Mexico that grows peppers so well). But this is definitely NOT your grandmother’s Tabasco sauce. Its recipe sounds more like a real sauce—with carrots and onions, key lime juice, agave nectar, as well as habanero peppers, garlic salt, grapefruit seed extract and salt—labeled as all natural ingredients. I tried the medium-to-hot variety and it wasn’t too spicy for me. I was actually dipping my finger in it and tasting it all by itself. It has a clean, fresh taste and tastes like food. And guess what? There’s no vinegar in it. I’ve just conducted a completely unscientific taste test with Tabanero, Cholula and sriracha. I now realize that part of why I don’t like the Cholula is the heavy vinegary taste—even though I like the taste of vinegar on its own. And lo and behold, the ingredients in Tabasco, too, are precisely: vinegar, red peppers and salt. Sriracha does have some vinegar, but it’s listed as the fifth ingredient and doesn’t overwhelm the chili flavor. Okay, there is room in my heart and in my kitchen for two favorite hot sauces. I will probably never buy another bottle of Cholula (though it comes in many flavors and is very popular with Mexican food) or Tabasco (sorry, guys). Tabanero will be my new go-to sauce for Bloody Marys, but it might also get a turn in the yogurt dip once in a while. I’ll probably alternate Tabanero and sriracha for spicing up regular dishes that need a kick. You can find sriracha hot chili sauce in most grocery stores and even in Targets with grocery areas. Get your bottle of Tabanero hot sauce ASAP—at this moment there are no retail outlets in Chicago (did you know there are such things as specialty hot sauce stores?? ), but you can order online. Then spice it up for National Hot Sauce Day–and keep your mouth and heart warmed up the rest of the year. Remembering James Beard – and welcoming JBFoundation awards to Chicago this year! I first heard about James Beard back in the 70s when I was just beginning to feel like a serious cook. I spent a lot of time reading cookbooks and a significant amount of time making recipes that sounded delectable—and doable without too many single-purpose pieces of equipment or exotic ingredients. He was one of my original inspirations—as he was to the entire nation of U.S. cooks back then who’d been raised on Jello salads and heavily mayonnaised vegetable and/or fruit combinations. The man even inspired my ultimate hero, Julia Child. Then I had a chance to see the guy in person. He was a huge man—I think something near 300 pounds. But then, Beard was born a huge baby—some say 13 or 14 pounds, so he came by it honestly as well as by indulging his passions for food. The day I saw him he was making – I will never forget it – a Swiss Cheese Salad. As if cheese isn’t salty and fatty enough, I thought, he’s going to put dressing on it! I think there were some chopped green onions and a few other things in there and some Dijon mustard in the dressing, but I don’t recall any greens in the ingredients. Yes, it was a salad made almost exclusively of shredded cheese—top quality, of course. Gruyere, no doubt. Take out the greens and this is somewhat like the recipe as I remember it. I was impressed by his flavor-is-everything-and-devil-take-the-consequences attitude towards fat in recipes—this at a time when fat was just beginning to be vilified as the culprit in America’s obesity epidemic. Nowadays, fat versus sugar is the debate that continues to spark hot contests. Chef Beard was also the guy who gave me my forever-remembered proportions for homemade vinaigrette—one and a half tablespoons of wine vinegar to six tablespoons of olive oil. The memory of seeing him that day is still precious. I can’t imagine how thrilled I’d have been to see Julia Child in person. But at least I got—and still get—to admire her from afar via her many television appearances. And now I’m thrilled for another reason. I’m proud that the James Beard Foundation, founded to honor that amazing guy, is holding its prestigious JBF 2015 awards ceremony for the first time in Chicago!! Monday, May 4 at Lyric Opera, both the Chicago and the national winners will be celebrated at a grand party. Read more and find insights on food at the James Beard Foundation’s blog Delights & Prejudices. Richness. How do we experience that in regard to food? What does it mean to say a food is rich? The dictionary says the word relates to a multitude of qualities besides possessions (wealth). Something rich is said to “have high value or quality, or to be well-supplied or endowed.” How about a food rich in history? Potatoes, for example. The seven-year-long Great Famine in Ireland in 1845. Or tomatoes – carried from South America in the late 16th century to all parts of the world and once thought to be highly poisonous. But, no, that’s not what we mean when we say a food is rich. Perhaps the grapes are rich – have high quality and thus can produce the best wines. Yeah, but that’s more about the qualities of the grapes and not so much about taste, which is what we’re mainly talking about in a cookbook (which I happen to be working on and which inspired this post). The dictionary goes on. “Magnificently impressive, synonym: sumptuous.” Oh, yeah, I can see that applied to a lot of dishes – Beef Wellington (filet of beef wrapped in pastry), anyone? Or “vivid and deep in color.” Yes, a rich red tomato. A deep, rich browned crust on your ribeye. Okay, we’re getting there. Merriam Webster continues, “having a strong fragrance.” Yes! Think about fresh-baked bread. About the aroma of pot roast on a cold winter’s night. Rich, for sure. Here’s one: “having abundant plant nutrients.” Okay, although we do use the phrase rich in nutrition – and perhaps strict vegans might use it in that sense – vitamins are not usually what we’re thinking of when we speak of the richness of a meal. Here’s one: “highly seasoned, fatty, oily, or sweet.” Indeed, this meaning is often used pejoratively – “That’s too rich for my blood,” someone will say of a dish loaded with butter or sugar or one sitting in a pool of rich wine reduction. These are BIG dishes of lush creme brulee – but the browned-sugar coating isn’t rich enough yet. And the last few from the dictionary: “high in some component” – again, this leads us to think of non-taste-related phenomena such as, for example, cholesterol, though we could use it to refer simply to taste itself. I like the mystery and subtlety of this definition: “meaningful, significant.” Yes. I can feel this one when I speak of a meal that is rich – including taste and sensation but layered perhaps with some emotion like love, happiness, contentedness. Another one, “lush” seems suitable for rich, silky, creamy foods like ice cream or crème brûlée. And finally, “pure or nearly pure” could refer to the intensity of a single flavor, as in soup base that is rich with beef flavor or a dessert composed of several items (e.g., crust, filling and topping), all flavored with lime, or with vanilla. And then there’s umami, the so-called “fifth taste.” Discovered after centuries of belief that there were only the classic four: salt, sweet, sour and bitter. Umami is defined generally as “savory, related to lip-smacking, rich tasting.” How about some triple-cream brie cheese? Surprisingly, people of good will today still disagree as to whether umami is a legitimate classification. But why not? It fits. It’s a concept missing from the other four, so it makes sense as a category. But I doubt it will ever have the rich, multilayered connotations of the “r” term. I mean, “rich” even feels umami on your tongue, doesn’t it? Acadia, 1639 S. Wabash in the South Loop, recently launched a new version of the Acadia Burger, one of the bar menu’s most popular items. 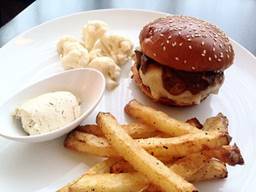 The 6-ounce wagyu, brisket and chuck burger, created by Chef Ryan McCaskey, is topped with a mushroom ragout and Gruyere Grand Cru cheese and served on a sesame bun. It’s served with pickled cauliflower and hand-cut fries seasoned with house-made lemon pepper seasoning (containing over 20 ingredients) and foie gras butter. Sounds like a fascinating combination – and the fries look cooked just right. The previous version, based on Burger King’s Stacker, was recognized as one of Chicago’s best burgers by Thrillist, TimeOut Chicago, Zagat and others. Acadia expects the new version to be just as well-loved. McCaskey said the new version “was inspired by my family eating at Hardee’s on the way to my grandmother’s house in Iowa as a kid.” Clearly, the wagyu beef and Gruyere cheese alone push it several notches beyond the inspiration. To inspire yourself, check it out at http://www.acadiachicago.com/. Quartino Ristorante & Wine Bar, 626 N. State St., invites you to help celebrate its 9th anniversary on Tuesday, January 6 at its Annual Wine Bash. 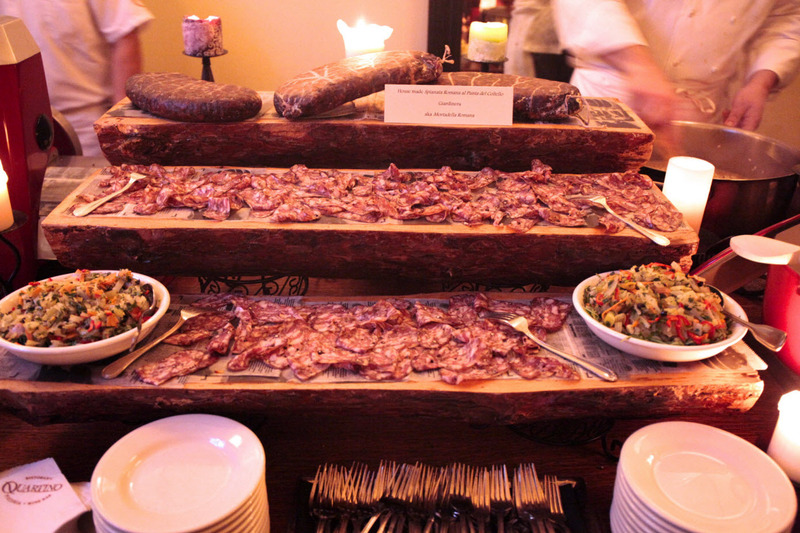 From 7 to 9 pm, $25 at the door gets you samples of some of Quartino’s most popular regional Italian food and wine specialties like pizza, Chef Coletta’s house-made salumi, Polenta Fries, Veal Meatballs, and more. To drink, either rosso or bianco Antica wines or the restaurant’s famous White Peach Bellini (Prosecco and house-made white peach puree). “The evening will highlight many of the items that have been on our menu since day one in 2005,” says Executive Chef John Coletta, “and that are still some of our customers’ favorite dishes.” Head up to the second floor when you get there (social media #LateOnState). Kanela Breakfast Club (locations in Old Town, Lakeview and Wicker Park) welcomes power breakfast meetings with free wi-fi and complimentary parking . NATIONAL SOUP MONTH – all month any guest who donates a canned soup or non-perishable food item will receive a complimentary order of Kanela’s signature Loukoumades (Greek doughnut, lemon honey syrup and toasted walnuts). Donations will be made to a local food pantry. Not valid with any other offer or promotion, one per person. National Blueberry Pancake Day – Wed. January 28. Every order of Kanela’s signature blueberry pancakes comes with a free first cup of Julius Meinl coffee. One per person. classic breakfast, omelettes, French toast and more. $6 mimosas and $8 bloody marys made with CH Distillery Peppercorn Vodka. Pair with a 3 ounce Rhinelander Lager bottle for an additional $2. The complete menu is available HERE. The Compass regular menu specializes in wood-fired pizzas and beer lovers choose from 180 bottled and 20 draft options.